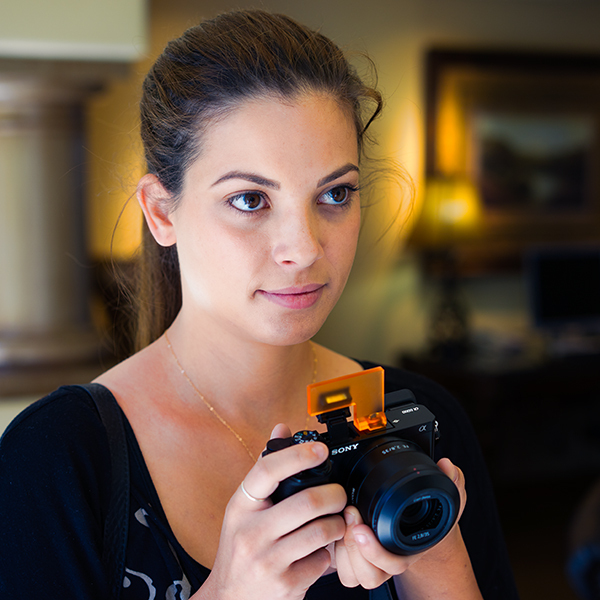 The Sony NEX and A6x00 Pop-Up Flash has a clever design. The flash has a linkage design that allows it to be rotated upward so light can be bounced off a ceiling or a wall. It’s very versatile and with some planning you can get the look of an off-camera flash that’s more flattering than harsh direct on-camera flash. 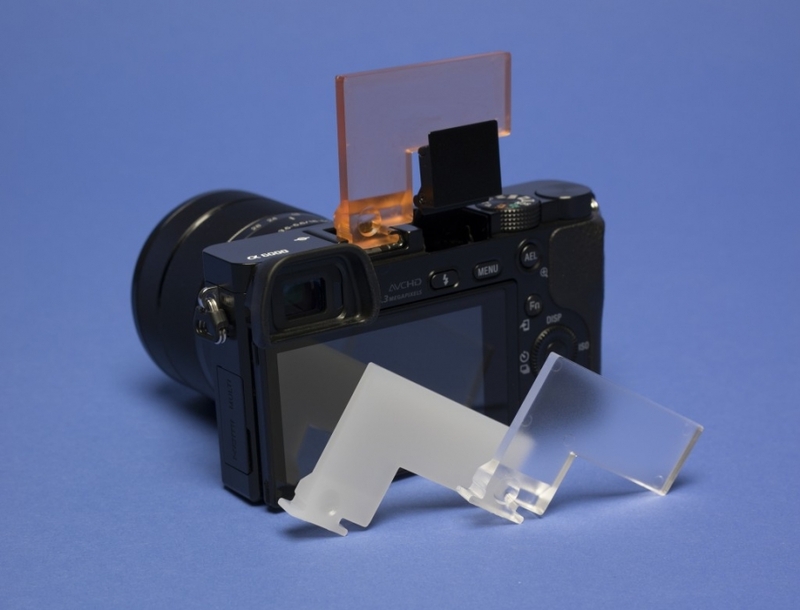 There are 3 bounce cards that come with the Sony A6000 Bounce Card Set (also fits NEX-6) – a Clear Card, an Amber Card and a Translucent White Card. The bounce card fits into the hot shoe and holds the flash rotated upward. Amazon SONY A6000 Bounce Cards Set of 3 cards. Clear, Amber and White. B&H Photo/video: B&H Photo Sony A6000 Bounce Cards Set of 3 cards. Clear, Amber and White. SONY NEX-7 Bounce Cards Set of 2 bounce cards, a clear card and a white translucent card. The NEX-7 is an older version camera so only the white and clear card set is available. The shipping for international orders is $8 USD. I will reply with paypal payment instructions. The Clear Bounce Card will allow more light to reach the bounce surface than the white translucent card. Use the Clear Bounce Card for maximum bouncing of light. The White Translucent Card will “light-up” and act as light source itself and illuminate your subject as well as bounce the light, use the white card if you want some fill-light along with bounced light. The Amber Bounce Card has the same color as the RoscoSun CTO gel. It will add a warming tone to the image. Light is coming through the window on the right and there is a white wall to my left. I used the clear Bounce Card for the left image and direct flash for the right image. The Bounce Card design allows the flash to be moved from the front to the back of the card to quickly switch from direct to bounced light. The Bounce Card also eliminates the awkwardness of rotating the flash with the index finger while trying to release the shutter with another. With the Bounce Card in place the flash can be moved in the front or back of the Bounce Card. The Bounce Cards can be casually used with walls and ceilings as the bounce surface or set up a white foam board or reflector for more of a studio setting. In this comparison the White Bounce Card results in softer light while direct flash is a bit more over bearing. Also the shadow and slight red eye is apparent in the direct flash example. The Sony Pop-Up Flash has a GN = 6 so you’ll want to be close enough to a wall or ceiling for the light to be bounced back to the subject. Usually about 5 feet (1.5meters) is a good working distance. If you are too far from a bounce surface the camera will choose (when in Auto-ISO) a higher ISO to overcome the reduced light. With the camera in landscape orientation the flash is bounced off the ceiling and gives a softer lighting of the room. You can use P, S, A or M mode. In P, S and A mode your camera chooses what it thinks are the best settings and these settings will work most of the time. These modes work well if you don’t care to be technical about camera setup. However if you want to control the settings use M manual mode. M mode gives you complete control to set the aperture, shutter speed and ISO. For flash photography ideally you want your camera to shoot around 1/60 second, a wide open aperture and ISO200 – 1200. Check your image data after a few shots. For the Amber Bounce Card use the “FLASH” white balance to create a warm toned image. Avoid AUTO white balance, otherwise the Amber warming cast will be “corrected.” The White and Clear card do not create a intentional color cast so it would be ok to use AUTO white balance OR Flash white balance. This image was taken with the amber bounce card near a small mirror on the wall. The white balance is nearly incandescent, I manually set it to 3400K rather than true incandescent 2850 K. I did some touch up processing and used Alien Skin to enhance the contrast and color. Ambient light matters. It is possible for the ambient light to be too bright or too dim for a good flash bounce image. If you are not getting the side lighting from your flash you had hoped for, the ambient light may be too bright or the ambient light may be directional and fill in the shadow side of the face. Try increasing the shutter speed to darken the ambient light and bring out the flash effect. Your camera has a maximum flash sync of 1/160 second, M mode or S mode is needed to control the shutter speed. The other extreme is when the ambient light is too dim, if the camera is in AUTO ISO it will respond by increasing ISO to higher levels and the image may be unacceptable. Try setting the ISO to 800 and letting the flash do the work. Should I crank the dial to +3 flash compensation (via Menu setting) when using the flash bounce cards? Cranking the flash compensation up to +3 with the flash bounce card will usually not make a difference. In most cases the small flash will already be firing at full power at the 0 setting unless you have bright ambient light. Of course, if you’d like it won’t hurt to try +3 compensation. It is easy to experiment and compare the 0 vs. the +3 flash compensation. Should I use the Fill, Rear Curtain or Slow Sync flash setting? The best setting to use for the flash bounce cards is the Fill flash setting. The camera will be set to 1/60 sec shutter or faster and blur from handholding won’t be a problem. You can use the Rear or Slow Sync but keep in mind the shutter speeds will be set according to ambient light. With rock solid hand holding skills, images at 1/30 or 1/40 sec are possible, beware shutter speeds can drop to impossible levels like 1 or 2 seconds. Sony needs to add a custom minimum shutter speed when using Auto ISO. There should be 2 questions to ask yourself before you put a bounce card on your camera. What is the ambient light and what is the bounce surface? I just mentioned ambient light above. 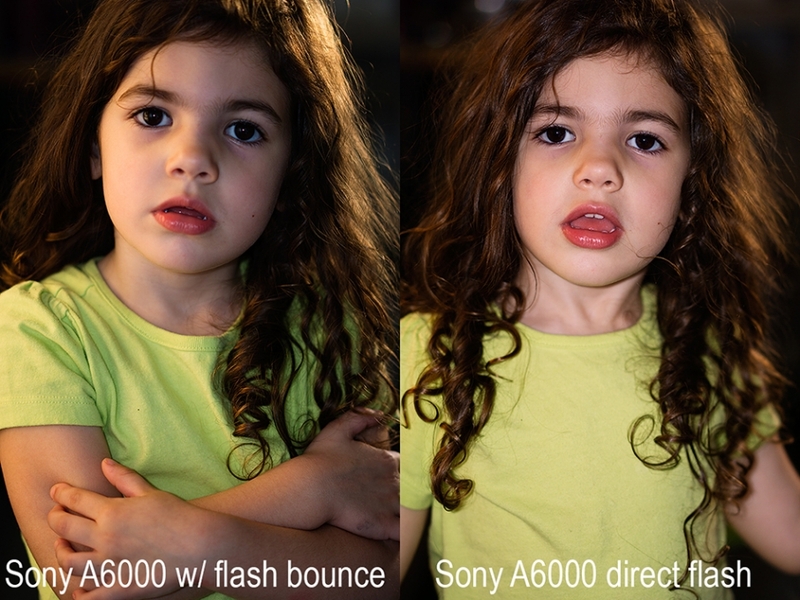 For best results the bounce surface should be 1-2 meters (3-6 feet) from the flash. I like a clean white bounce surface, glossy is better because it reflects more light. Don’t restrict your creativity to only white surfaces; a yellowish wall will create a warming tone, blueish walls will be reflect a cool tone. Scout for a good bounce surface and move your subject(s) to the area to create the optimum lighting setup. It is easy to flip the flash from bounce flash to direct flash to see the results. This is my nephew, Jacob, an avid lacrosse player that’s excited to be playing on the JV team. I used a clear bounce card bounced against a yellowish wall in a hotel lobby (you can see the wall color behind him). There was window light coming through behind him. A6000, f/5.6, 1/60, ISO800. Alien Skin Portra 160 filter. Position your subject near the bounce surface for optimum side lighting, 3-6 feet (1-2 meters) is best. I like the white card for ceiling bounce, the white card becomes illuminated and fills shadows in the eyes. Try using the tilt LCD and shooting from a higher angle, this technique will bring the flash closer to the ceiling. The white card also works well for small groups, 2-4 people. When a longer lens is on the A6000 it possible for the flash to cast a shadow from the lens. Try the flash bounce card to reduce the shadow. White poster board or foam board can be held in one hand as a bounce surface. Hold the board so the flash fires into it and angle it slightly toward your subject. A Mirror on the wall can be an excellent bounce surface. The reflective quality will result in effective side lighting. The Amber Flash Bounce on the A6000 creates a warm light. I used a mirror on the wall as the bounce surface and created strong side lighting. The ambient light in the room is fairly low so most of the lighting came from the flash. Notice the background is a bit darker, camera setting was 1/60sec, f/5.0, ISO200. The left image is the amber card bouncing from my right, the center image is the clear card and bounced from the left, I positioned her so her hair would catch some of the sunlight coming though the window. The right image is direct flash, it’s easy to convert to direct flash to have that image for comparison. Bright ambient light is pouring through the windows in these images so the camera set the shutter speed to the highest sync rate, 1/160 sec. Window lighting and flash bounce with the amber card are both coming from my left. Thank you for this fantastic tip. Never use my (direct) flash on my NEX-7 as it is to harsh and it is also a very good low light camera anyway. Due to your tip. Last weekend made my best portret photo ever. Also due to the fact I never realized one could pull/push the flash up as well. Now even considering buying the bounce cards. Nice site and pictures. Keep up the good work. I wanted the retail price for the Flash Bounce set (two cards) to be $14.95. Amazon sets the shipping price when the seller sets the product profile. It is $5 and I cannot edit it, BUT I can adjust the price of the product, which I reduced to $9.95. This is noted in the product description on the Amazon Flash Bounce page. The bounce cards (2) are mailed as a package, not a letter, because of the .5″ thickness. As an added benefit, tracking is included when the product is shipped as a package. I too am often frustrated by shipping costs especially when it becomes an unannounced profit boost for the seller. There is no intent on my part to overcharge for shipping. My bounce cards arrived here in the Philippines just now! Hi similar to Hans VDC tried to order from Amazon but wont ship to the UK. Also Amazon UK don’t have your account. Hi similar to Hans VDC tried to order the NEX7 type from Amazon but wont ship to the UK. Also Amazon UK don’t have your account. I am from Canada and I would like to order bounce cards for the a6000. Can’t seem to purchase the Sony A6000 Bounce Cards. Amazon keeps popping up and have none. Where can I get this kit? I am from Winnipeg, Canada. What would be my cost?